With one less hour available on Sunday, there may have been a few long runs cut short over the weekend, but if so, we couldn’t spot them amongst the runs posted on the LGRC Facebook and Strava groups. Here’s a brief run-down of some of the past week’s goats on the run. This event describes itself as a “flat, fast and friendly event for all ages and abilities”. For the speedier runners, it also serves as the Welsh 10km Championships race. The route takes in Cardiff Bay’s iconic landmarks, starting and finishing in Roald Dahl Plass and passing the Wales Millennium Centre, Mermaid Quay, the Pierhead Building, Senedd, Porth Teigr, and the Cardiff Bay Barrage. 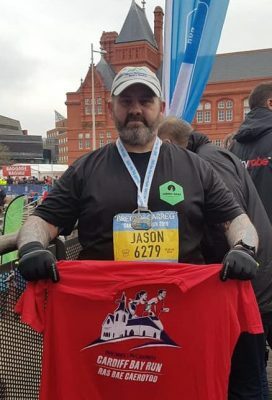 Jason Midwinter‘s run in Cardiff was his 3rd event in his “12 in 12 months” challenge. He shaved 10 minutes off his personal best to finish in 1:08’52”. Jason went through 5k in 34’00”, so looks to have paced his run perfectly. Joanne Lutwyche was another Goat who ran even splits, finishing in 1:15’45”. Danni Braine completed the run in a time of 45’50”. Phillip John Morgan knocked 8 minutes off his time from the 2018 edition of this event to run a PB of 50’24”. Running almost the same time was Andy James who knocked 2 minutes off his PB to run 50’27”. Maureen Lucas had a fantastic weekend, running her 100th parkrun on Saturday, followed by the Yeovil Half Marathon on Sunday. Maureen ran 27’43” at Upton House, then 1:54’07” the next day. 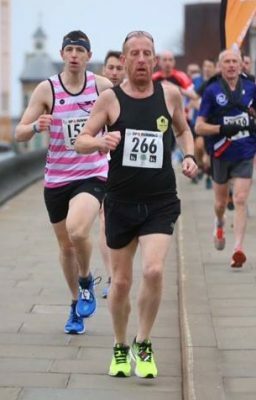 Also doing the parkrun/Yeovil double was Trevor Stow who followed up his 25’56” over 5km on Saturday with 1:52’59” on Sunday. Stephen J. Reynolds was another Goat at Yeovil, and he ran the 13.1 miles in a time of 1:50’46”. 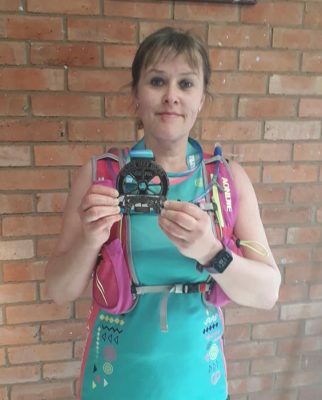 Melissa Farnworth completed the Silkin Way Ultra, running 50km to finish her first ultramarathon in 5:45’18”. At the inaugural Royal Borough of Kingston Spring Raceday, Rob Crawford ran 1:57’07” in the 16 mile event. The 8 mile event was run by Debbie Cutlan (pictured above) in 1:27’24”. It was the longest event Debbie had run so far and she said she “enjoyed every step”. At the Croydon Half Marathon, Ini Ekwo ran 1:51’55”. At the Peterborough Spring 10K, Marcin Bukowski ran 58’48”. It was his 3rd event in 3 weeks. Shara Hayes was also at Peterborough, and she finished in 54’58”. At the Lee Valley Velopark 10 mile event, Simona Scavo ran the distance for the first time, finishing in 2:03’18”. Julia Benning broke the 60 minute mark with 58’20” at the Treehouse 10K in Cholsey. Luis Palicio was the 3rd finisher at Concord parkrun in Sheffield. Sharon Louise beat her previous best time at Pomphrey Hill parkrun by just over 2 minutes. At Clitheroe Castle parkrun, Ruaridh Macdowall was the 1st finisher, running a PB of 19’25”. In Western Australia, Gareth Arnold knocked almost a minute off his PB at Mount Helena parkrun, running 20’48”. 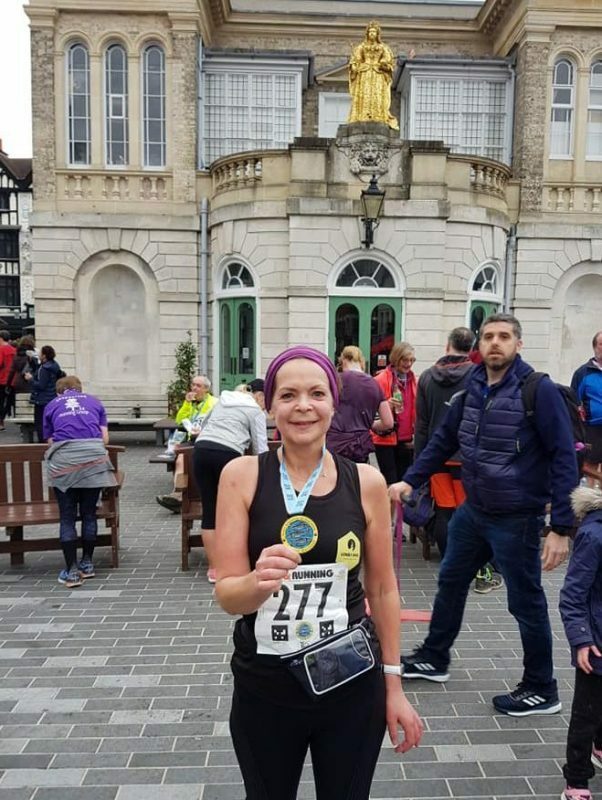 And last, but by no means least, Ruth Harries completed her personal challenge of running at least a mile a day for 365 days – running 1,139 miles over the last year and picking up 10K, half marathon, and marathon PBs along the way.